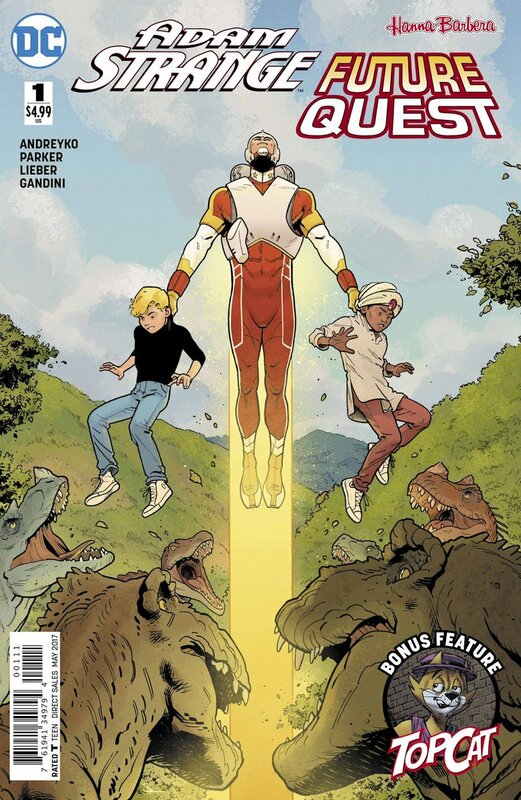 DC Comics: Future Quest aka now THAT'S more like it! Recently recommended to me by our own Voltron64, Future Quest is pretty much everything I want from a comic. It's well drawn, well written, has lots of action and character bits, it's not angsty and it's FUN. Oh my God but it's fun. I just . . . I don't want to spoil anything else because of how good this book is. I need to go out and catch up on this immediately. It's basically this giant crossover between the classic Hana-Barbera action/superhero shows, with a slight re-imagining as far as costumes go. The only ones I'm kind of disappointed that I haven't seen so far is the Teen Force, but it's a blast seeing old school heroes like Birdman teaming up with more well known heroes like Johnny Quest, Space Ghost and the Herculoids. 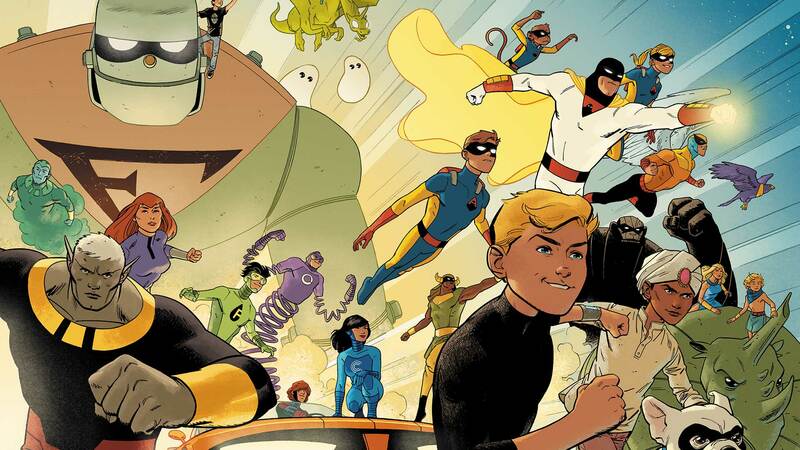 Re: DC Comics: Future Quest aka now THAT'S more like it! I have and let's say it is glorious in its ability to BE fun and nostalgic. I love how Space Ghost was portrayed. A great throw back to my youth and a respectful job to honor Hannah Barbara. Honestly, if I were in charge of adapting it, I'd make it a series of highly detailed, hour-long or feature length OVAs or Web Content with a Gustav Holst/Richard Wagner-esque soundtrack, just the whole thing heavily inspired and influenced by Giant Robo: The Day the Earth Stood Still. Make it a damn feast for the senses. DC needs to get Captain Marvel in on this. Have Billy team up with Samson and Goliath, the new Mightor, or Birdman. Heck, have him team up with Johnny Quest so he can hang out with a family and be the muscle for the group. Maybe do something heartwarming like having the Quest family invite him to stay for the weekend, celebrate a holiday with them. Or get other heroes in on the action and have Superman team up with Birdman. I've got to say, after reading this series and watching some of the old cartoons, if I was going to ever make a superhero universe, this would have a big influence on it, along with classic superheroes, the Marvel Cinematic Universe, 80s cartoons, old Pulp heroes, Tokusatsu and certain types of anime. This series pretty much has a little bit of everything. Space Ghost and the Galaxy Trio are sci-fi space adventures. Just a lot of fun uniqueness spread around, and it makes these heroes really stand out when they crossover. I'll also say that one of the best things about this series is that there isn't a hint of irony. There's no "haha, look how stupid this stuff was", or making fun of the older stuff to any large extent. The closest we get is the Impossibles, where the animated series is ret-conned as fictional music videos/tv shows the band star in as part of their act. Beyond that, everything else is played completely straight and embraced. Hence why I see a comparison between it and the '90s Giant Robo OVA series, which was an (unholy) amalgamation of Wuxia, Superheroes, Richard Wagner, Mecha Anime and pure insanity. Hence why I see a comparison between it and the '90s Giant Robo OVA series, which was an (amazing) amalgamation of Wuxia, Superheroes, Richard Wagner, Mecha Anime and pure insanity. The unholy was meant in a good way! I'm loving this series. In fact, I was sort of planning on doing it next in my character builds. Okay, let me get my head back in the game and I'll at least get up a statement of intent by tomorrow. Well you've convinced me, I'm going to have to download the trade to my kindle tonight. I'll also DEFINITELY have to check out that Space Ghost/Green Lantern crossover. Out of curiosity, did anyone here read the Space Ghost New Edition from last year? Wondering if it's worth the buy.